Available in PDF form from Princeton University’s Blue Mountain Project. In micoform at: University of North Carolina (Chapel Hill), University of Kentucky, University of Delaware, and Johns Hopkins University. In April 1915 French cubist writer and painter Amédée Ozenfant published the first issue of L’Elan, a magazine dedicated to French art in response to the first World War. Dedicated to the “French spirit,” L’Elan was intended as propaganda not so much to support the French war effort as to sustain French art and culture, a way of showing solidarity in the face of unprecedented slaughter. Nonetheless, the magazine’s aesthetic stance was inherently a political one, as much of the magazine’s contents attempted to portray the French as more cultured and aesthetically revolutionary than their German opponents. Ozenfant paid particular attention to the visual appeal of the magazine, most notably in his experimentation with typography. His use of a mélange of typefaces within a single poem or essay became what he referred to as psychotypique, where the typeface of the work participates in the meaning of the text. He cites André Billy’s definition of psychotypie as his working definition: “art that involves making the typographic characters participate in the expression of the thought and in the painting of states of the soul, no longer as conventional signs but as signs having a meaning in themselves” (L’Elan Apr 1915 2). During its brief lifespan, L’Elan featured the works of celebrated painters and poets, many of whom were also fighting in the war: Guillaume Apollinaire and André Derain, for instance, are touted not as artists but as “soldier[s] in the trenches.” In addition to cubist experimentation and typographical flair, the magazine often included more realistic drawings of soldiers; “Types de la Grand Guerre,” for instance, was a series of soldiers sketched by French soldiers on the warfront. Faced with financial difficulty and the recent death of this father, Ozenfant cancelled the magazine in 1916. He later said that the magazine “opened all doors to me,” having put him in contact with so many different influential artists. l’étranger croit peut être qu’en France l’Art n’appartient qu’à la Paix. Ceux qui se battent, nos amis, nous écrivent combien la guerre les a attachés davantage à leur art : ils aimeraient des pages où le réaliser. ce journal sera ces pages. l’étranger ne pourra qu’admirer cette élégante insouciance, cette fidélité à l’Art. ce journal, français, est aussi le journal de nos alliés et nos amis. nos amis russes déjà, lui ont promis leur riche collaboration. il luttera contre l’Ennemi partout où il le rencontrera, fut-ce en France. entièrement désintéressé, il se vendra au prix coûtant, son seul but étant la propagande de l’Art français, de l’indépendance française, en somme du véritable esprit français. -First issue of L’Elan, April 15, 1915.
the foreigner believes, perhaps, that in France Art belongs only to Peace. Those who are fighting, our friends, write to us how much the war has fastened them more strenuously to their art : they would like some pages where they can realize it. this newspaper will be those pages. the foreigner will only be able to admire this insouciance, this loyalty to Art. this newspaper, though French, is also the newspaper of our allies and our friends. our Russian friends have already promised their rich collaboration to it. it will fight against the Enemy everywhere it meets him, even in France. entirely selfless, it is sold at cost price, its only goal being the propaganda of French Art, of French independence, in short of the true French spirit. Born into a wealthy family in Saint-Quentin, Ozenfant attended Saint-Elme d’Arcachon and Captier in Saint-Sébastien. After school he returned to Saint-Quentin to pursue drawing and painting. In 1907 he enrolled in Académie de La Palette and in 1908 began exhibiting his works. Ozenfant founded L’Elan in 1915 in an attempt to celebrate French art and, more widely, solidarity against the Germans. 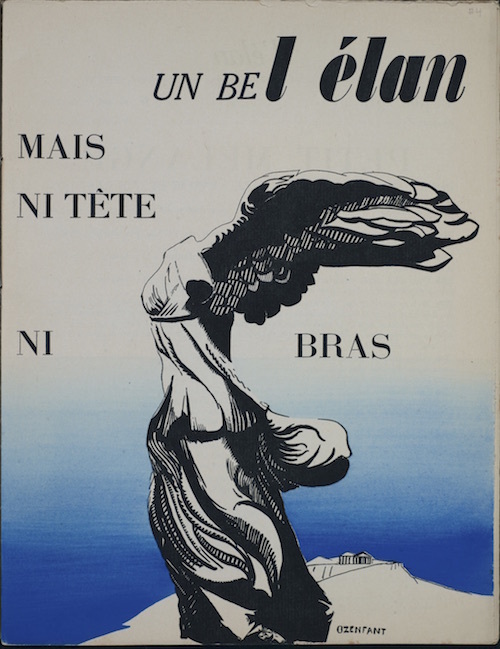 Though he terminated L’Elan at the end of 1916, he went on to cofound another magazine, L’Esprit Nouveau, with Le Corbusier (pseudonym of Charles Edouard Jeanneret). The two men used their magazine as an outlet of Purism, an aesthetic movement they developed that emphasized the impersonality and purity of artistic elements. In the 1930s he wrote several articles for the Architectural Review on color as an essential, rather than decorative or secondary, aspect of architectural form. In 1936 he moved to London and established the Ozenfant Academy of Fine Arts. About two years later he moved to New York. Ozenfant became a United States citizen in 1944 and returned to France in 1953 where he remained until his death in 1966. Ducros, Françoise. Amédée Ozenfant. Éditions Cercle d’Art: Paris, 2002. Print. Freeman, Judi. “Amédée Ozenfant.” World Heritage Encyclopedia. Web. Golding, John. Ozenfant. M. Knoedler & Co., Inc.: New York, 1973. Print. Ozenfant, Amédée, ed. L’Elan. 1915 – 1916. Paris: Société Générale d’Impression. Blue Mountain Project. Web. Ozenfant, Amédée and Charles Jeanneret. La peinture moderne. Paris: Les éditions G. Crès, 1920. Archive.org. Web. Shaw, Jill. “Still Life Filled with Space.” Art Institute of Chicago Museum Studies. 35.2 (2009): 68-9. Web. Vatin, Philippe. “Du pacifisme des artistes pendant la grande guerre.” Guerres mondiales et conflits contemporains. 150 (1988): 17-43. Web. Wigley, Mark. “White-out: Fashioning the Modern [Part 2].” Assemblage. 22 (1993): 6-49. Web.